BRUSSELS, 17/11/2016 – New figures confirm that security is the main concern for the people of Nagorno-Karabakh, and that combined support for independence or unification with Armenia grows from 91.7% in 2015 to 95.1% in 2016. Hovhannes Grigoryan, CEO of the Institute for Political and Sociological Consulting (IPSC), presented results of a new opinion poll on socio-economic developments, public perceptions of foreign affairs, international recognition, and Nagorno-Karabakh conflict resolution. The poll was conducted in July 2016 (shortly after the Four-Day War) on a sample of 1,081 people in Stepanakert and the 7 regions of Nagorno-Karabakh, and cross-referenced with a similar survey conducted in March 2015. The figures show an increase in the number of people who believe Nagorno-Karabakh should be independent, compared to those who prefer it become a part of Armenia. An even more significant trend was observed among younger and educated, who support the independence in a much higher proportion (61.2% of population between 18 and 30 years support independence; 53.6% of university educated support independence). Furthermore, public’s approval of Government’s performance in the sectors of Defence and Foreign Affairs has decreased, while the perception that Nagorno-Karabakh is on the right track is still considerably high at 78.9% percent. The question of peace and security remains the predominant concern for half of the people of Nagorno-Karabakh, followed by unemployment and international recognition of the NKR. Despite these concerns, declared intentions for migration remain at a very low level. Commenting on this last aspect, Hovhannes Grigoryan said that: “the poll has showed that the Four-Day war of April 2016 has not affected the migration tendencies of the Nagorno-Karabakh population, which remain the lowest in the South Caucasus region, when compared to figures from similar polls conducted in Armenia, Azerbaijan and Georgia. In other words, people of Karabakh, regardless of the hardships of the unexpected war outbreak in April, are determined to stay in their country”. 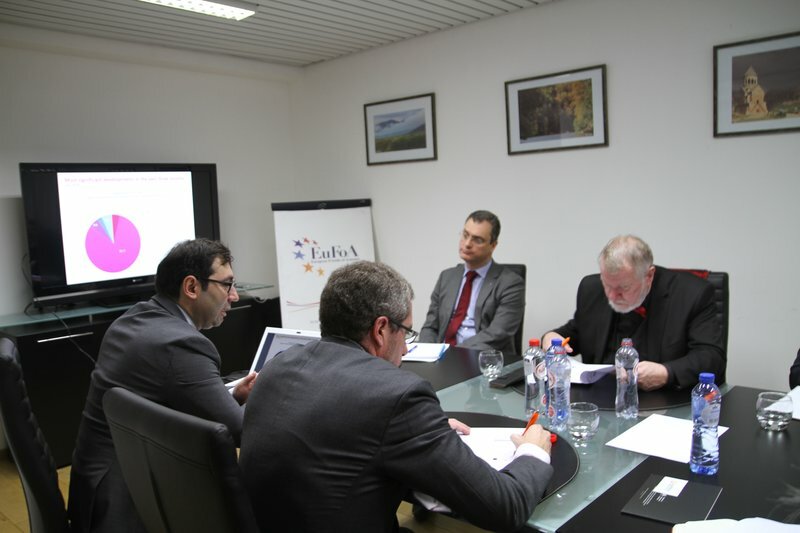 Following the presentation of the research, Diogo Pinto, EuFoA Director said: “The results of this latest opinion poll, conducted after April’s Four-Day war, very clearly show the determination and the resilience of the citizens of Nagorno-Karabakh, in spite of the continued Azerbaijani aggression and attempts for destabilisation. Although an overwhelming majority believes that further aggressions are likely to happen in the near future, they crave for peace and trust the OSCE Minsk Process and the international community. As European Friends of Armenia, we urge the international community and the EU in particular, not to let the people of Nagorno-Karabakh down. Pressure must be kept on Azerbaijan so that it understands that only a peaceful solution is acceptable and that no further violations of the cease-fire will be tolerated”.